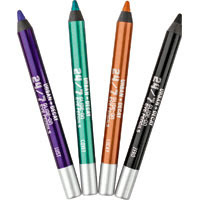 At Ulta, when you make a purchase of $20 on any Urban Decay item(s), you will receive 2 mini 24/7 Glide-On Eye Pencils. Thery're the same size as the ones that come in the Book of Shadows palettes so they're pretty big and will that you quite awhile. I don't think you get to choose your colors but I'm pretty sure there are only 4 colors available. I'm pretttttty sure the colors are Lust, Flipside, Baked, & Zero (from looking at the picture.) Just add your free items to your cart when you're checking out. There's no code for this. I am 100% sure this works online and am almost certain that it works instores too -give it a try. This is a code exclusively for VIBs at Sephora (you're a VIB if you've spent $350 in '09 or this year.) You get a pretty Tarina Tarantino bracelet ($30 value) with any purchase. Last I've heard, they already ran out online so you might want to check instores. I got mine instore last week (will post on that.) The color choices are: purple, black, and read. Remember, this IS a Tarina creation so it's meant to be fun -nothing elegant. Some people were complaing that it's just "plastic" but go to Tarina's site and you'll notice that nearly everything is plastic! I think it's a cool deal.. plus it's free! The set includes a really cute bright blue traincase (looks like a tiny suitcase) and some full size and deluxe size goodies. Click the link to view everything that comes with the set. It's also a $130 value. I really love the case. If I weren't on a no-buy, I'd just stock up on things I'd normally get at Sephora anyways and scoop this cute little case up. Hope this helps anyone that was planning on buying from these sites. There are tons more great deals that I haven't even mentioned. Make sure to check RetailMeNot before you buy anything to see if there are codes or coupons. Also, try to combine codes when you can! Lastly, sign up for emails from your favorite stores. You'll be surprised at the great deals you'll find -free shipping, free gifts, etc. 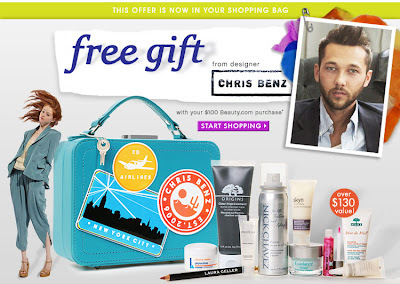 If you want to know of any more beauty related deals that I've heard of, leave a comment or send me an email.